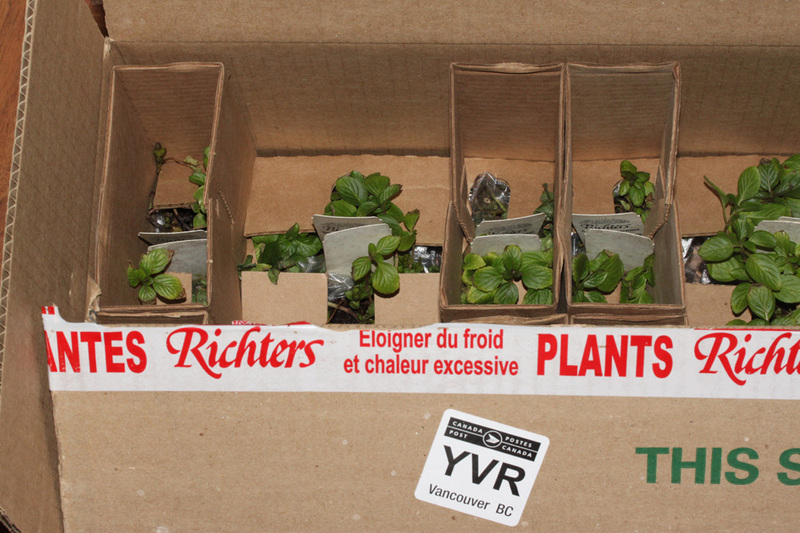 30 Scotch Spearmint plants in 2-1/2″ pots arrived by Canada Post, to Vancouver Island BC via Richters Herbs, Goodwood, Ontario Canada. 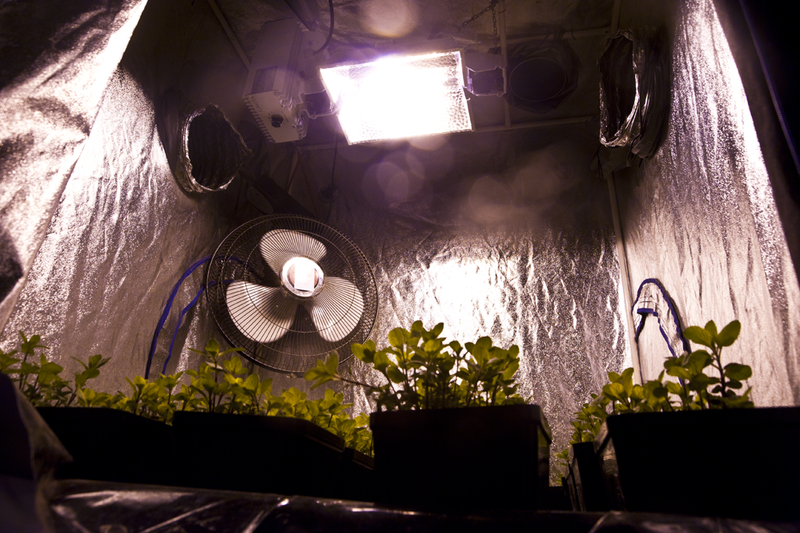 Plants were in a semi dormant state on arrival. 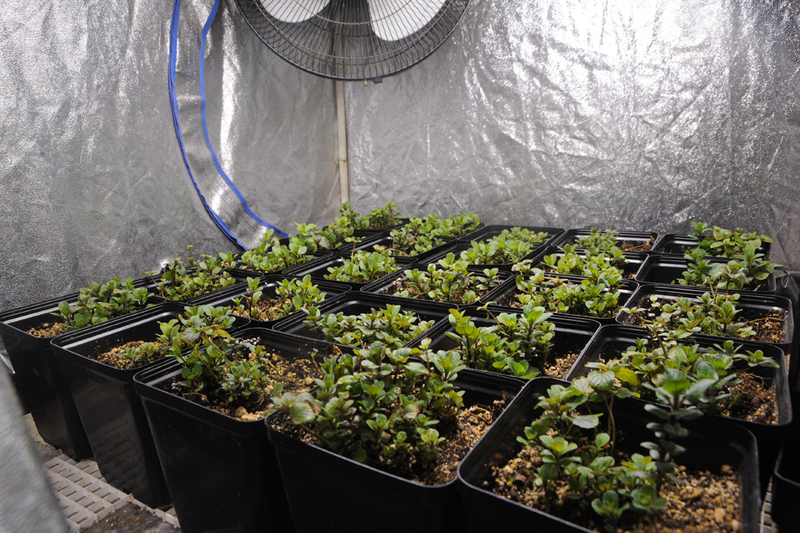 First 12 hours plants were kept at 55-65 Deg F with no light source, to “thaw” and to help begin to break dormancy. Of the 30 plants received, 26 were kept. 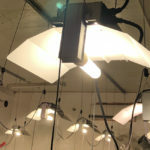 400 watts of Metal Halide Light (about 5500Kelvin, Plant Max Brand) at a level of 800-1200 lumens was supplied over a 3 foot by 3 foot area. 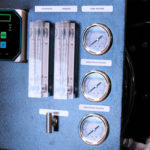 Temperatures were kept cool, around 65-7 deg F with the lights on, initially for an hour or two at a time, followed by an hour or two of darkness, with increasing lighting being provided in duration and intensity the first 48 hours. 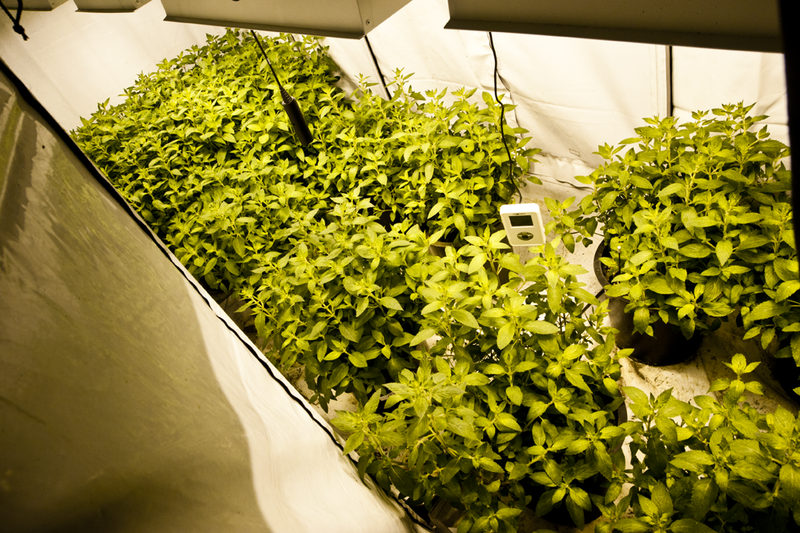 After 3 days average light intensity is 1200-1600 lumens, with a duration of 16 hours per day. At this time, Carbon Dioxide levels were increased over ambient with a Green Pad CO2 “Grand Daddy Pad”. 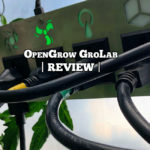 This is a natural chemical pad approx 1 feet by 1 and a half feet wide that is suspended in the growing ten and misted lightly with water; the water activates a steady release of carbon dioxide that is diffused in the 3 foot by 3 foot growing area in the grow tent. Humidity readouts indicated below optimal, so fresh condensate water was occasionally spilled onto the flood table surface to help increase humidity from 40 to 65% on average with lights on. 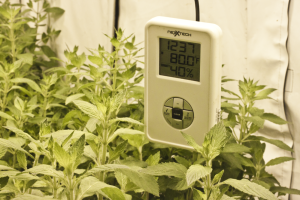 Humidity rises to 65 to 80% RH when the lights are off. 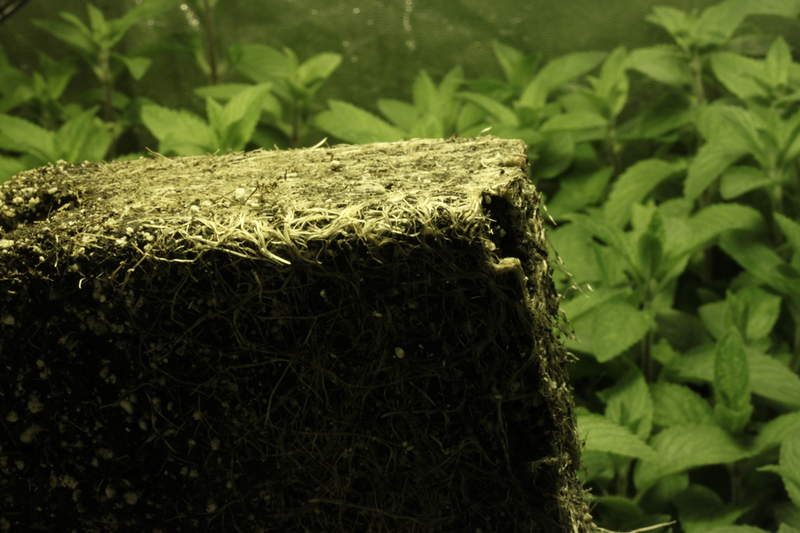 On inspection of roots, new, white root growth is beginning to occur in the root zone.It is 5 days after receipt of Spearmint stock material, and new growth is appearing from soil surface in all of the plants kept. Very little old foliage is growing or anew (only about 20% of old shoots). 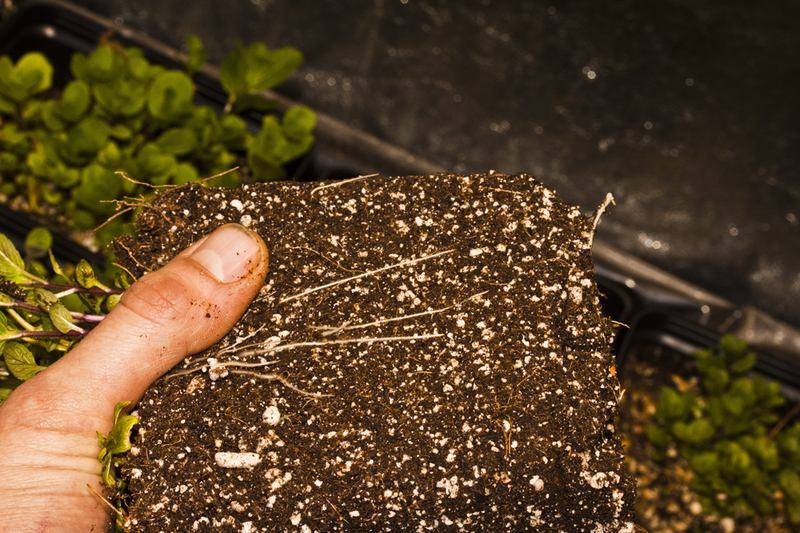 Rather, new growth is emerging from soil surface level, and appears very dark and healthy. 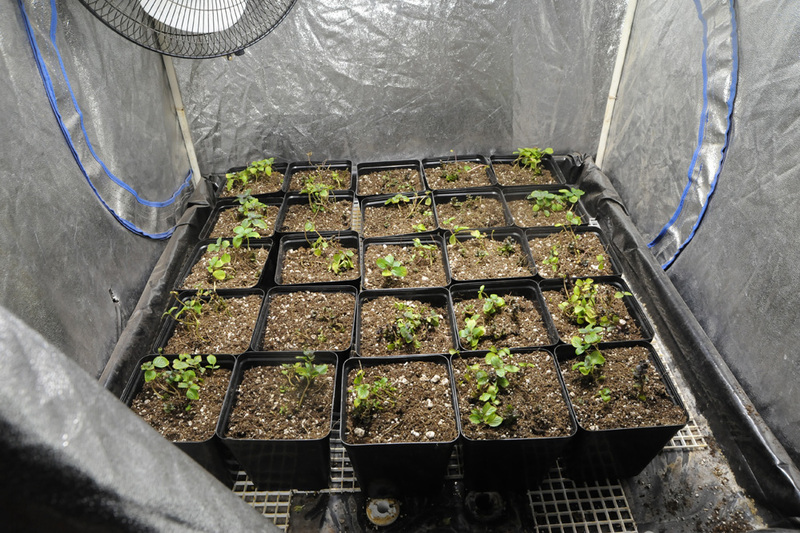 25 of the 26 plants were transplanted into 5 inch square tall pots. 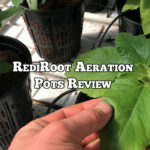 The pots are filled with a peat-based soilless mix that contains perlite, small amounts of vermiculite, a low fertilizer charge and a light mychorhizal inoculation (Pro Mix HP). All plants are receiving identical treatment(s) at this time. 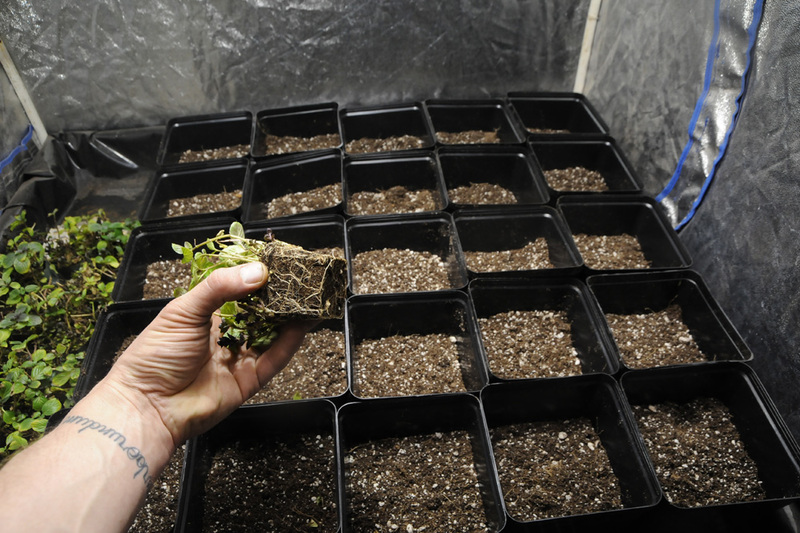 Following transplant 23 Litres of condensate water with 2 ml per L each Rock Nutrients Fusion Grow and Supercharge was hand watered evenly among the 25 transplants until light run-off was achieved. Transplant occurred just at the onset of the dark cycle to allow the plants sufficient time to recover and adjust before the next photoperiod commences following transplant. 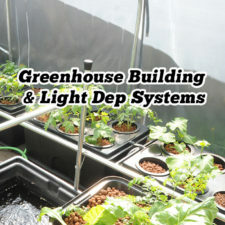 Plants will be raised in the final conditions described in previous entry until they they require further transplant-ultimately into 5 gallon “top hat” style nursery pots where they will receive 16 hourts of lights on at 4000 lumens of HPS (high pressure sodium lighting) in a climate controlled (sealed environment, CEA) “grow tent”. 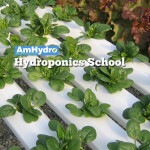 Each plant will have a final plant spacing of approx one foot between plants and one and a half feet between rows. 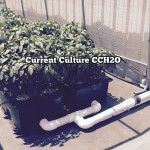 Until next transplant, plants will be supplied fresh condensate water, as needed, and given mild fertilization every other watering with Rock Nutrients Fusion Grow and Supercharge. 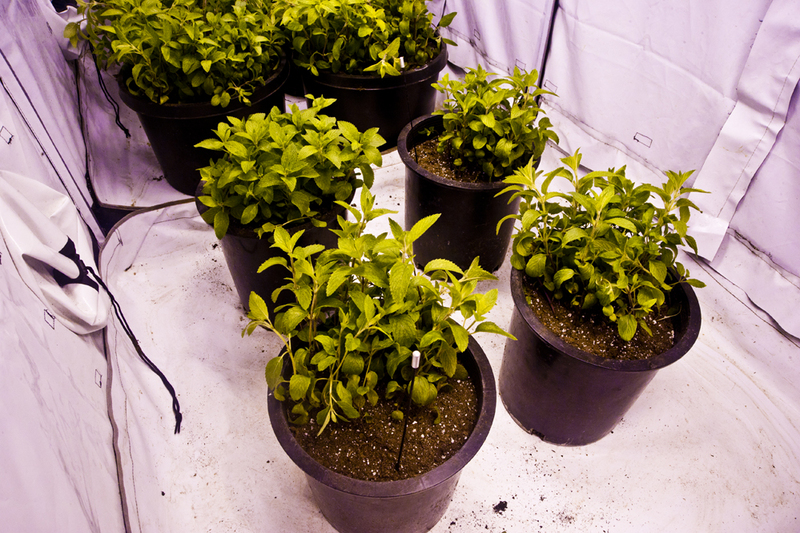 Plants are becoming established successfully in new containers and appear to be growing very healthy and free of any visible problems. Humidity is slightly lower than optimal, with Relative Humidity levels occuring at about 45% with the light on, and increasing to 65% with the light off. 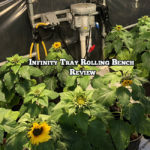 A light misting of water on the surface of the planting table (while avoiding the foliage, because under intense lighting) helps to rasie humidity. 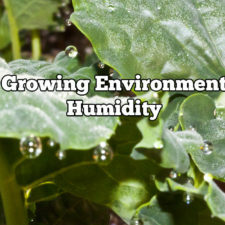 Plants while healthy with the slightly lower humidity appear more vibrant when humidity is 55-65% Realtive Humidity. 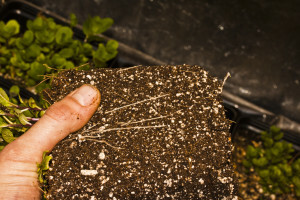 The planting medium has remained evenly moist, and plants have received on mild watering and feeding as described previous, since transplant in the 5″ pots. 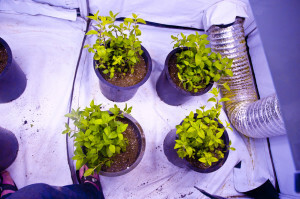 Plant spacing has been increased due to healthy growth. 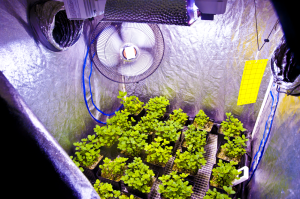 In order to ensure that the plants were receiving sufficient light levels, and to prpeare the plants for final lighting levels (+4500 Lumens HPS light) that will occur after another transplant and more spacing, the light source was upgarded to a Gavita Pro 1000 DE HPAS light source. 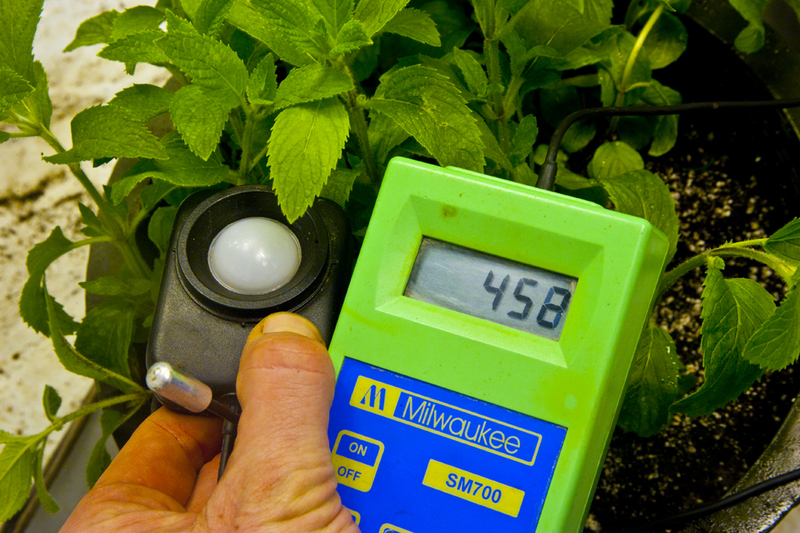 Since the are is about one square meter, the light is operated at 600W ouput (ouput selection dial). 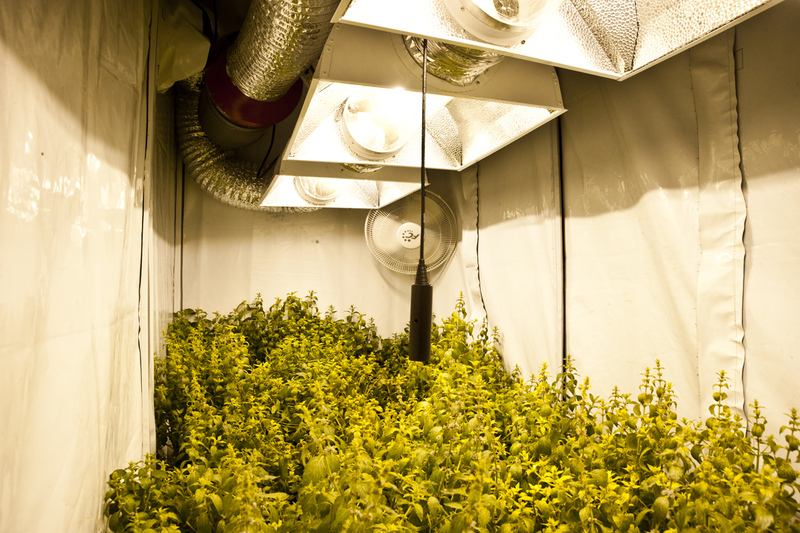 Average light levels are about 3500-4000 lumens, within the lighting foot print generated in the square meter of growing area. 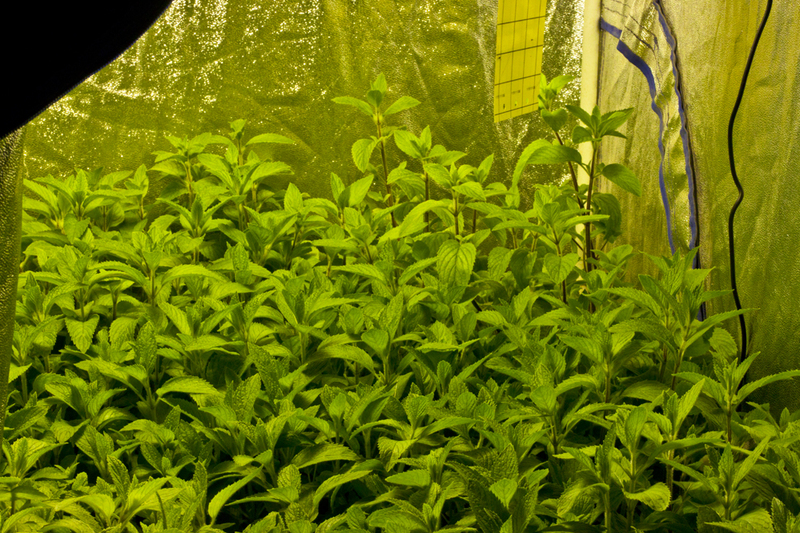 The spearmint plants may have a minor thrip population-yellow sticky traps are used to observe and control populations. If sufficient numbers are detected, a mild pyrithium spray will be used as a first treatment, if necessary. 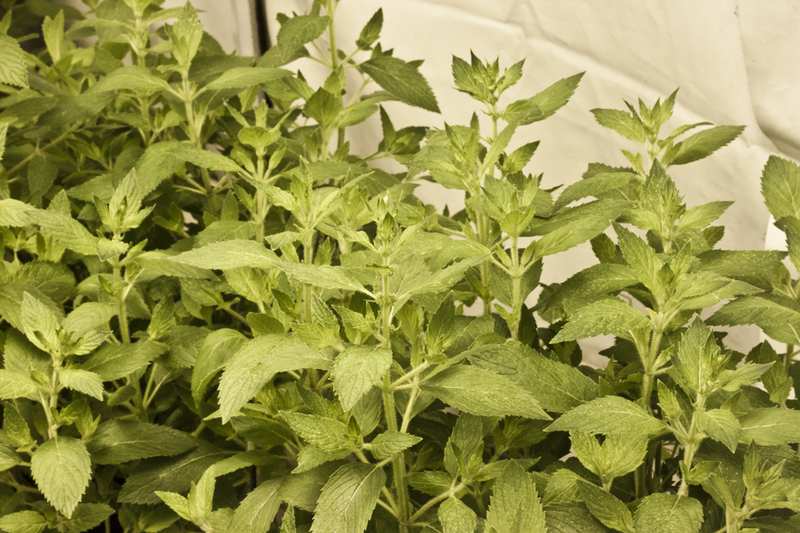 The young spearmint plants have rrecieivng light waterings with condenstae water as needed. Typically every other day. 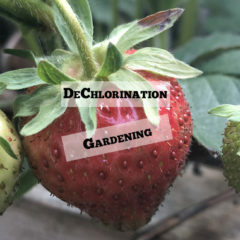 Fertigation, using condensate water and 1/2 strength Rock Nutrients Fusion Grow and Rock Nutrients Supercharge with a pH of 6.5 is applied every other watering. 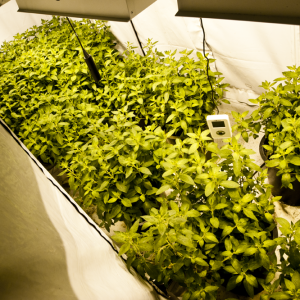 All plants are recieiving identical feedings and growing conditions, with similar light intensity levels via HPS lighting, approx 4200 Lumens. 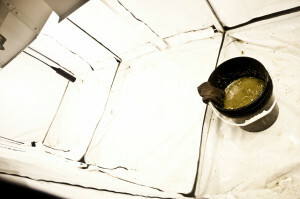 The yellow sticky trap indicates few flying insects in the garden area. 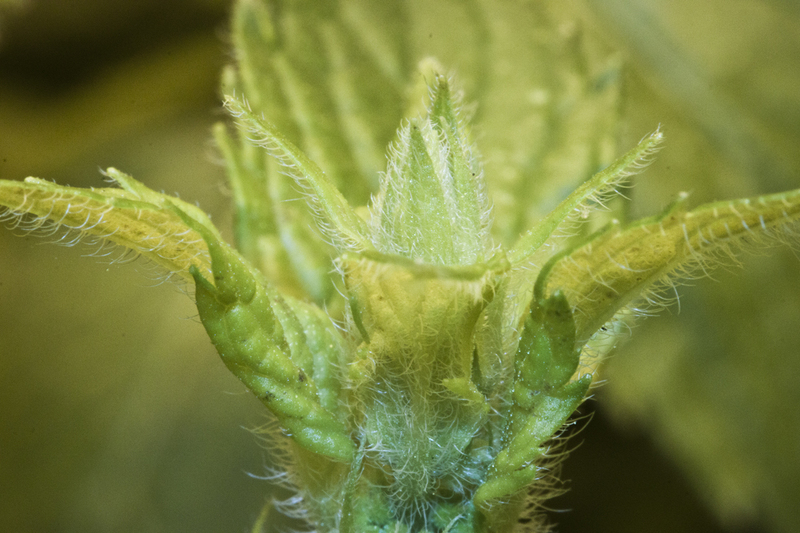 Leaf inspection revealed minor insect damage on just a few of the leaves-thrips and/or whitefly. 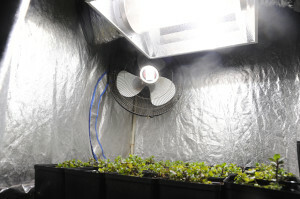 A light spray of Pyrthethroids via “Doctor Doom” aerosol has been applied once, about one hour after lights went out. 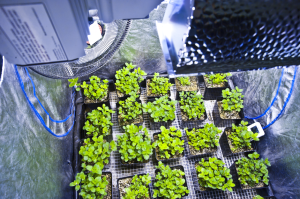 Plants showed no negative affects after application. 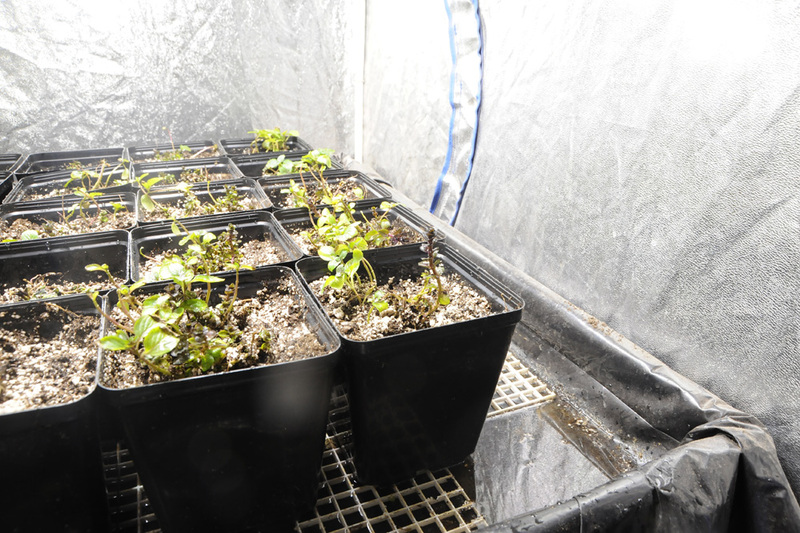 All plants are ready for final transplant at this time, although not round bound, as photo(s) may indicate. Health and vigour appear homogenous amongst individual plants in the garden-final division to CONTROL and TEST groups will occur at transplant. 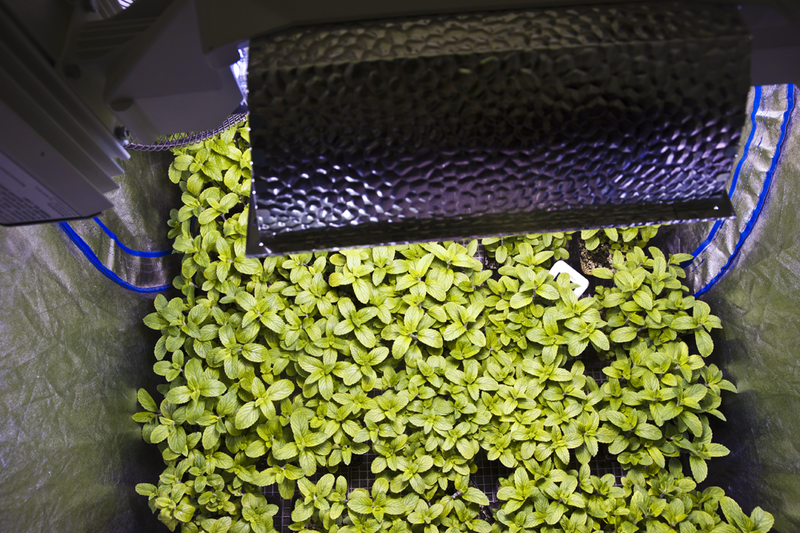 Following transplant, plants will be moved to final growing area with HPS lighting and climate control with a spacing of one foot between plants and one-and-a-half feet between rows. CONTROL and TEST plants will be randomly mixed in final sealed growing area, approx 4 feet by 12 feet by 7-1/2 feet tall. 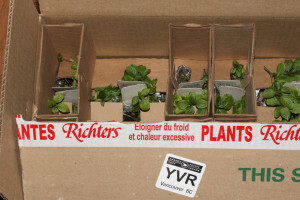 It’s been approximately 32 days since receipt of Scotch Spearmint root stock from Richter’s Herbs. At this time, the Spearmint pants are growing vigorously, and all have received identical treatments, as outlined above in the growing journal. 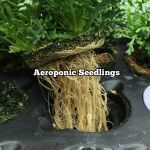 All plants are well established and are of near equal size, both in aerial and rhizospehere areas. 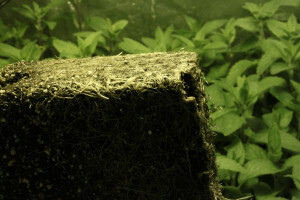 All plants are 10-12” tall and have filled in the growing space allotted to this point in time. 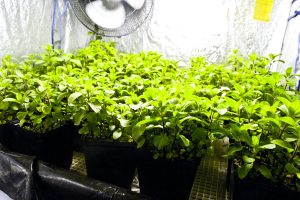 On January 7th, 2014 a; Spearmint plants received final transplant. Relocation and were designated as “Test” or “Control” in the final growing area. 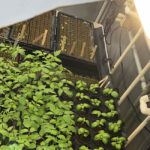 The final growing area is HomeBox (Germany) and measures approximately 4 feet by 12 feet and is around 7-1/2” feet in height from floor to ceiling. 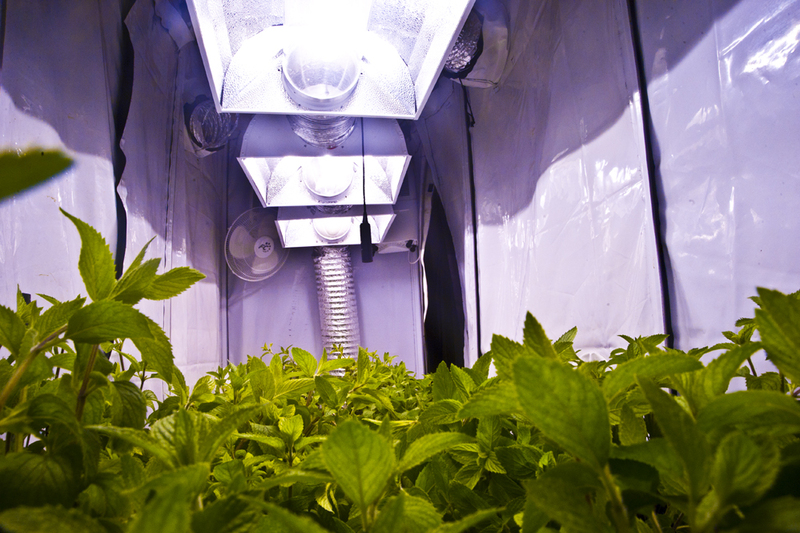 The interior of the HomeBox has been divided into 3 sections. 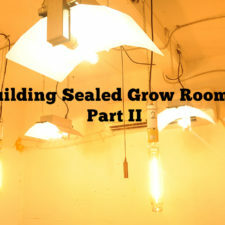 The entire length of the growing chamber is illuminated by FOUR-1000W HPS lamps housed in air-cooled growing reflectors. 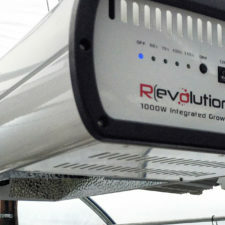 A PurGro 1K4 Electronic ballast (lights up to 8 KW lamps, or 4KW Continuous). 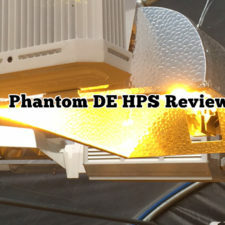 The reflectors have been adjusted to provide clearance from the crop canopy delivery approximately 4500 lumens of HPS light. Lighting is very even in a grid of the growing tent’s interior (4-1KW in a 12 foot long run). 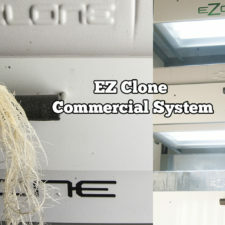 The grow tent was washed and disinfected prior to introducing the Experimental Growing Stock with a mild bleach solution, rinsed and allowed to dry. The initial feeding was the dame for all plants: Rock Fusion Bloom and SuperCharge, Full Strength in condensate water, pH 6.4. 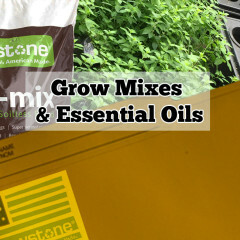 The transplant medium was the same as previous, fresh new Pro Mix High Porosity Peat Based Soilless Mix. 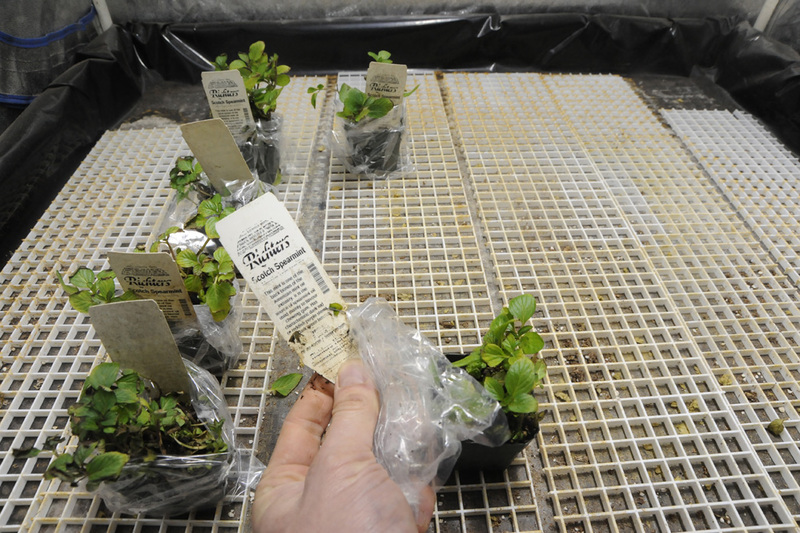 TEST plans are marked with easy to identify gardening stakes, CONTROL plants have no stake. 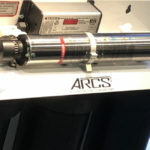 Condensate water will be applied every other water, alternating with Rock Fusion Bloom. 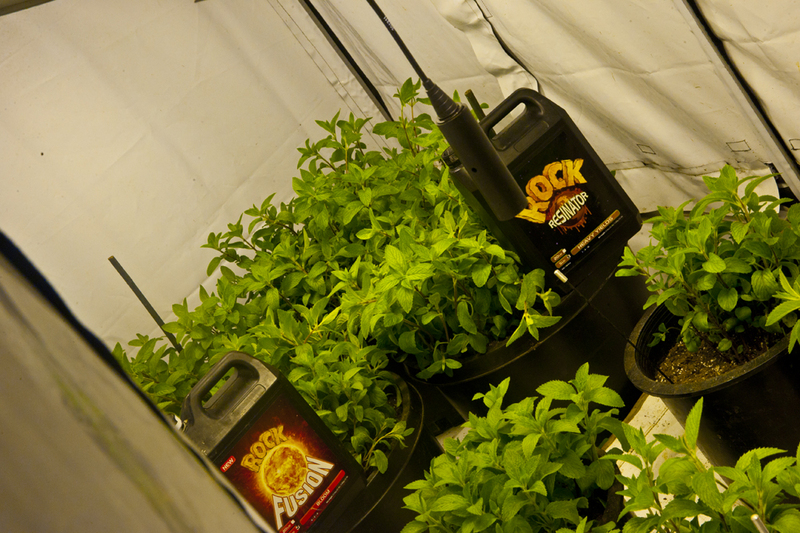 TEST plants will receive Full Strength Rock Resinator in addition to the Rock Fusion Bloom formulation applied with regular feedings. 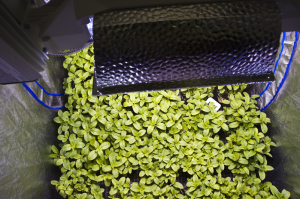 A photoperiod of 14 hours will be maintained to hasten the harvest of the crop versus 16 hours previous. Average temperature in the sealed and climate controlled growing chamber is 75 Deg F with the lights on, and 65 deg F with the lights off. 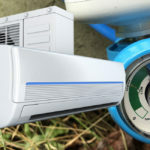 Relative Humidity is controlled via dehumidifier and is maintained at an average of 55%. 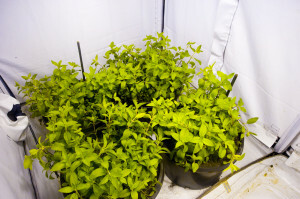 These images of the Spearmint Crop for Rock Resinator testing were taken on or around January 22nd, 2014. At this time it it appears plants are beginning to reach peak-flowering, as infloresecene are developing and trichome production, especially on new leaves surrounding floral structural growth, is also becoming more abundant. 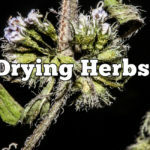 All plants appear very healthy, and free of any problems with regards to nutrition or disease-as notes, there is a small population of spider mites that appear to have come in on the material. However, the insect population does not warrant spraying; especially as residues may affect the quantification of resin yield data from CONTROL versus TEST plants. 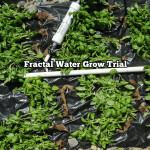 The growing environment remains stable, and waterings are typically required every THIRD day. 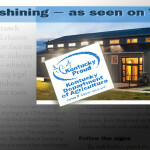 A FEED, FEED, WATER schedule is being practiced. 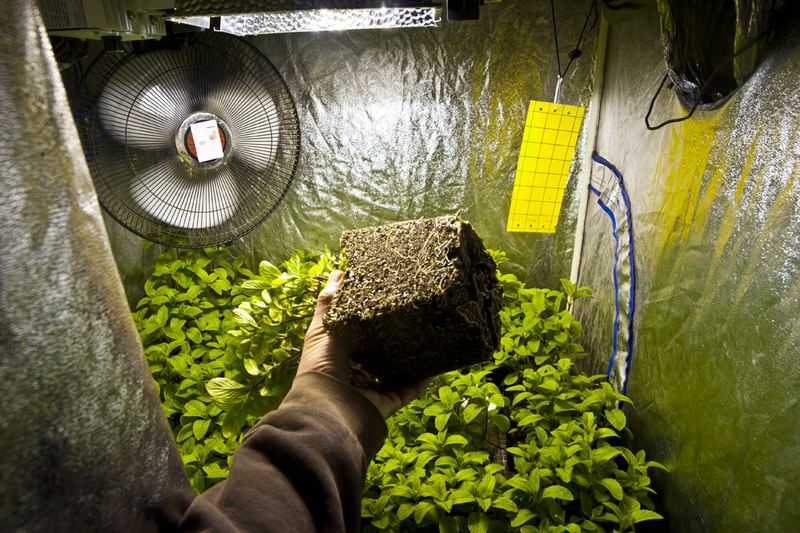 Overall FEED strengths are 1200 PPM (using 700 scale). As indicated previous, CONTROL Plants receive Rock Fusion Bloom only, and TEST plants receive Rock Fusion Bloom and Rock Resinator, as per labell directions. To date, there is a slight visible difference in TEST versus CONTROL plants, in that the TEST plants appear to have more developed infloresecence and possibly a higher degree of trichome production versus CONTROL plants since the flowering cycle and differentiation in treaments has begun. 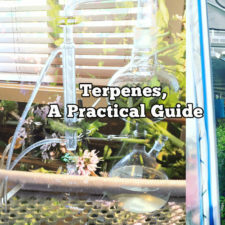 The crop appears to be in approaching the early peak floral phase, and while pungent, it is thought that resin production will begin to increase exponentially over the next two to three weeks. These images (below) of the Spearmint Crop for Rock Resinator testing were taken on or around January 22nd, 2014. 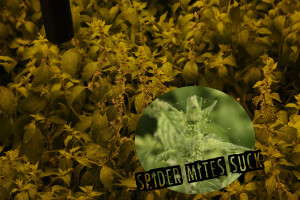 All plants appear very healthy, andff free of any problems with regards to nutrition or disease-as notes, there is a small population of spider mites thart appear to have come in on the material. 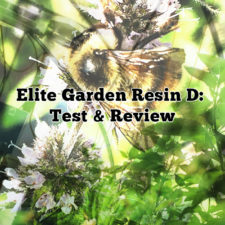 However, the insect population does not warrant spraying; especially as residues may affect the quantification of resin yield data from CONTROL versus TEST plants. 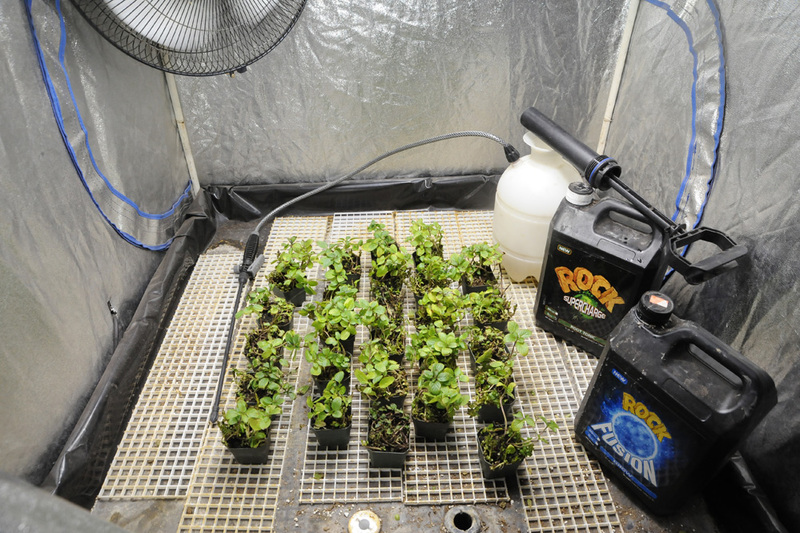 As indicated previous, CONTROL Plants revive Rock Fusion Bloom only, and TEST plants receive Rock Fusion Bloom and Rock Resinator, as per label directions. 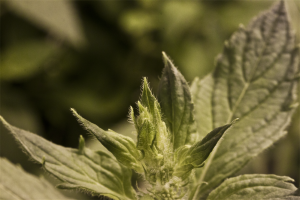 To date, there is a slight visible difference in TEST versus CONTROL plants, in that the TEST plants appear to have more developed inflorescence and possibly a higher degree of trichome production versus CONTROL plants since the flowering cycle and differentiation in treatments has begun. 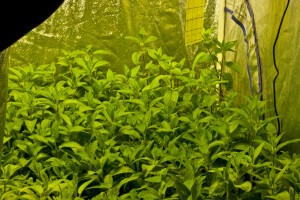 In our crop resin production testing, the crop appears to be approaching new maturity, as new growth is subsiding and development of infloresecence (flower spikes from spearmint) becomes more pronounced. Spearmint oil production is seemingly high at this period-while pleasant, a very strong spearmint oil odour is present, easpcially if plants are moved around during regular waterings and observation. 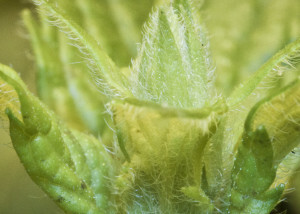 Visibly under magnification, trichome production has become prolific, and essential oils and reins appear to be secreting via trichomes, as noted with “beading” or sweating” of resins in macro photographic images. 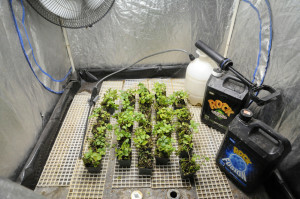 This resin production, under visual observation, appears to be slightly more pronounced in Resinator treatment plants (as indicated with garden stake) in the indoor garden plot. 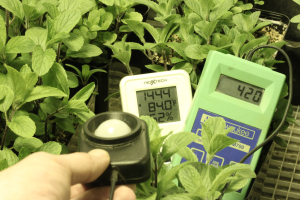 At this time, lights on temperatures are maintained slightly lower than previous, with an average of 70-75 Deg F with the lights ON and 60-65 Deg F with lights OFF. 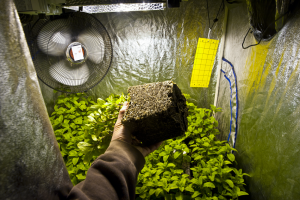 Photoperiod has been shortened slightly to 12 hours to promote maturity. As noted previous, Spider Mites populations were present, as were other pests on arrival of stock material from a supplier who does not use any chemical controls as policy. 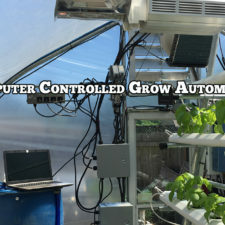 Early in the cropping cycle, as noted in growing journal, an application of Pyrethroids viaDoctor Doom aerosol had been applied. 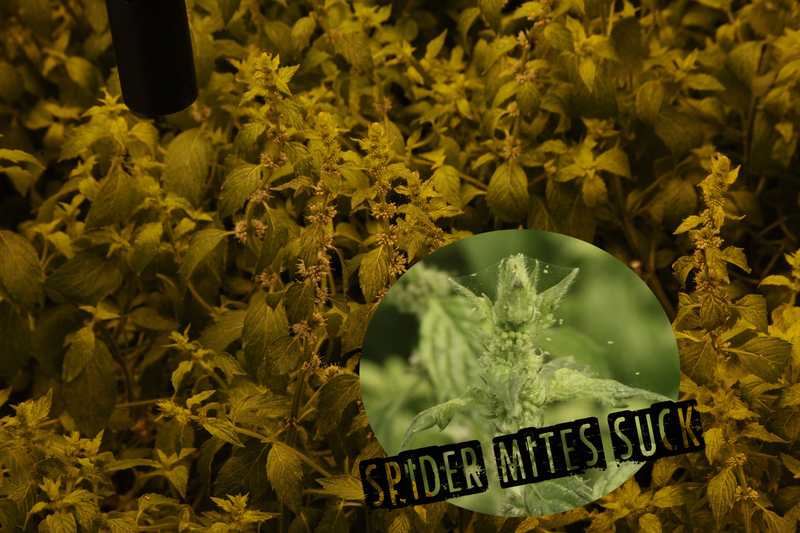 While there do appear to be significant Spider Mite populations on some of the plants (as observed by pest “tenting”), for the fact the crop is intended for resin extraction the plants will not be treated. 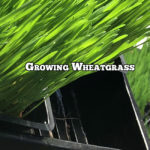 Anticipated harvest is approximately one week away, and resins are at their peak. At this point, any foreign substance mixing with the resins is considered highly undesirable for the purposes of this study. To provide some level of control without creating the potential of adversely affecting resin qualities, a concentrated jet of cold fresh water will be used to physically “blast” and disrupt the spider mite populations until the plants are harvested, providing some level of control without polluting the resins produced by the Scotch Spearmint plants.